When you hear the word dumpling, most people think of the puffy, biscuit-style dumplings. But did you know that there are noodle-style dumplings as well? They're just as easy to make and equally delicious. A large pot with plenty of space between the liquid and lid is essential so steam envelops the dumplings during cooking. Mix dumplings just until the dough forms. Like biscuits and pie crust, they can be tough if the dough is overmixed. As bubbles barely break the surface of the stew, steam sets the starch in the flour. This reduces the chance that dumplings will break due to agitation, clump together, or absorb too much liquid and become soggy. Be sure the dumplings have enough room to float and expand without touching. Whisk together 1 egg and 1 cup reserved milk-broth from Chicken & "Noodle" Dumplings. Mix together flour, salt, and baking powder in a separate bowl; make a well and stir in egg-broth mixture until a stiff dough forms. Turn dough onto a well-floured surface; cut in half and roll each to 1/8-inch thick. Cut dough into 1 1/2 x 4-inch strips, then add to simmering soup 1 or 2 at a time, stirring after each addition. 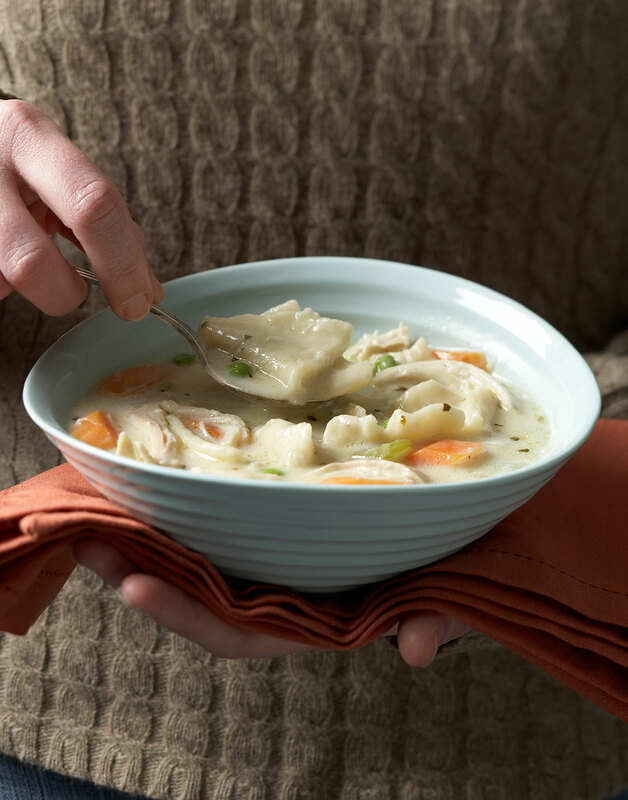 Cover Dutch oven and simmer soup until dumplings are cooked and no longer doughy, 15 minutes. The egg adds structure to the dumpling. To keep it from curdling on contact with the warm liquid, whisk slowly while adding the broth. Form a well in the dry ingredients, then pour in the broth mixture, stirring with a fork to combine. The dough will be very stiff.